Accessing the other internal components is easy as everything slides together nicely. 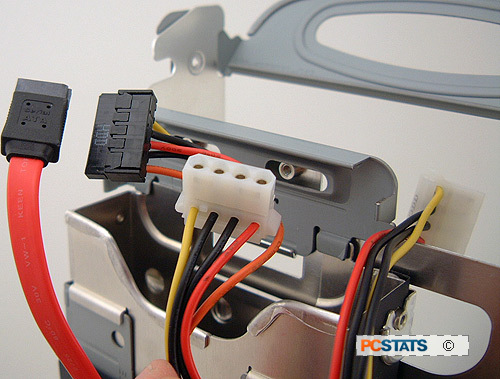 For example, all the cabling is pre-routed to just the spot you need it; the hard drive rack has your choice of IDE or SATA data power cables, and SATA or standard molex power connectors. Power connectors for the HDD and ODD bays are pre-wired into place. At first the MSi Mega mPC 945 seems much more complicated than necessary, but the tool free design really makes installation go a lot quicker. The instructions give a good, but brief run through too. The two DDR2 DIMM slots are accessible from the side of the chassis, without removing any other components. Up to 2GB of DDR2-533/667 memory can be installed. 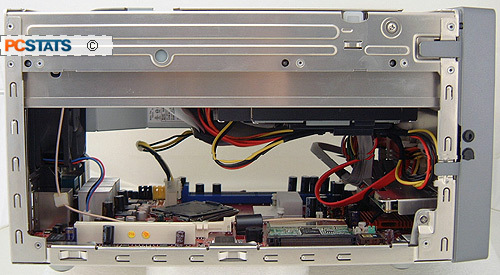 The box like section to the right is the 260W power supply for the MSI mPC 945 small form factor system cables are neatly integrated in with the chassis to reduce clutter. There is one PCI Express x16 slot and one 32-bit PCI slot available for expansion devices in the MSI Mega mPC 945. The PCI Express x16 slot in the MSI Mega mPC 945 can accommodate most double-slot cooling solutions. 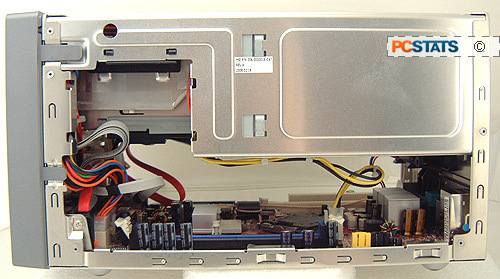 Just to the right of these expansion slots is a mini-PCI slot with a 802.11b/g wireless networking LAN card installed. The brown cable that extends to the left, and up by the fan is for the dipole antenna which is attached to the rear of the chassis. Up next, a quick look at the Intel 945G chipset and the Intel GMA950 integrated videocard.